Down in the sheltered terrain of the Barn Pasture…but not happy about it (that’s Max, Moondo’s former buddy, in the background). Moondo, my little bay horse, is the most opinionated equine I’ve ever met. This isn’t to say that he’s mean or obstinate or flighty, just that he has strong ideas about how his universe should operate. Ego and a dainty appetite are behind a few of his more maddening behaviors, but his principal preoccupation is with his field. Property lines and roads dictated our fence layouts, resulting in two small enclosures and one big one. The Barn Pasture, on the north side of the driveway, adjoins the barn. The Long Pasture on the other side of the driveway is, as you may have surmised, long and skinny. 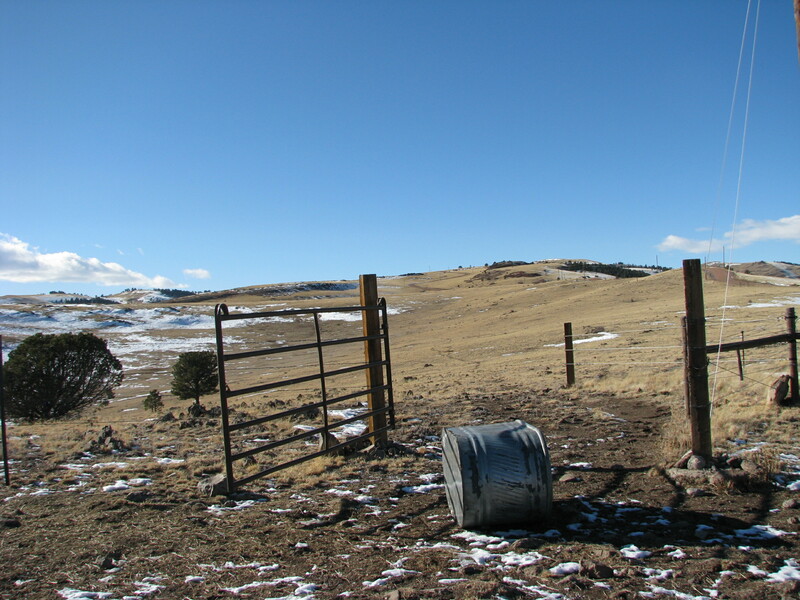 The Big Pasture consists of 35 acres, encompassing the top of a broad drainage where the ridge west of our house splits into two fingers. The attraction of the Big Pasture, in Moondo’s mind, has less to do with size than with sightlines. Trees are scarce and the geography is such that pretty much the entire field is visible from inside the perimeter. There’s thick meadow grass at the Barn Pasture, but the ground swoops low between two shoulders of land and it’s surrounded by ponderosa pine and rock outcrops. It’s sheltered in winter, which I consider a plus, but Moondo disagrees with my logic. He likes to keep tabs on his surroundings and seems to be impervious to inclement weather. He hates the Barn Pasture, and is annoyed that I insist on feeding at the barn in winter. In the mornings, and in spring and fall when the weather is more mild, we feed hay at the end of the Long Pasture, near the gate leading into the Big Pasture. Accessibility makes the spot convenient, but it’s pretty exposed, so we built an open-bottomed box out of leftover deck planking to keep hay from blowing away. The box is tough, weather-resistant, and heavy enough that it stays put. Unfortunately, it’s not big enough to prevent a big and food-aggressive horse like Moondo’s pasture-mate, Jake, from hogging the contents, so we split the hay ration and put Moondo’s share in a galvanized metal water tank a short distance away. I’m not sure if flipping the tank started as a way to make it easier to glean the tastiest bits of hay, or because eating out of the tank feels claustrophobic, but flipping the container has become quite the thing with our horses. Now they don’t just flip it to dump hay, they also bang the tank back and forth when they think more hay should be forthcoming. Now. The hay tank headed for the Big Pasture. At some point last fall, Moondo had an epiphany. He made a connection between flipping the tank and its position in the field, and started rolling the tank up the hill a few rotations every day. 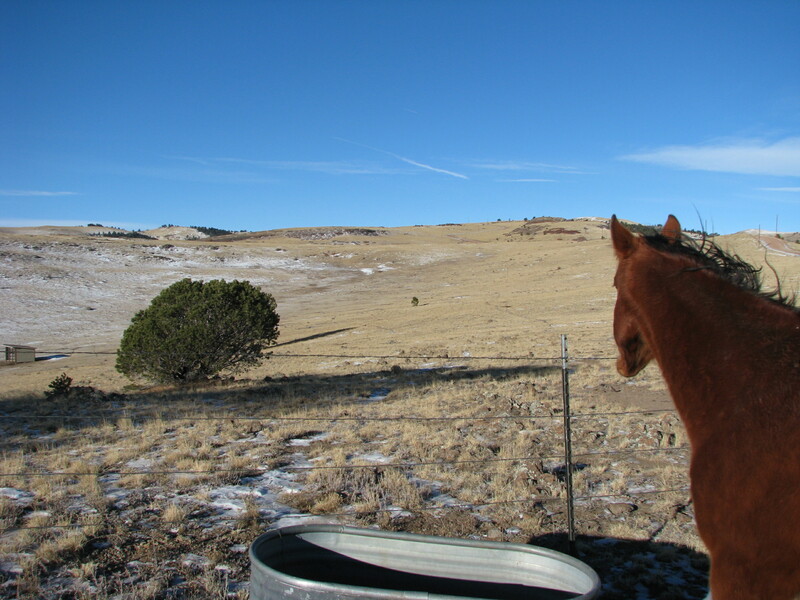 I knew he wanted to be higher up so he could see down into the Big Pasture, but I wanted the tank lower, where it would be somewhat out of the wind, so I would pull it back down. The next day we’d do the same thing. Eventually I decided to see where he’d go with this project, and stopped repositioning the tank. I was pretty sure his aim was to get it out into the Big Pasture. After a few days, he got the tank up to the crest of the hill, then spent a few more days trying to maneuver it under the fence. That would require lifting the lowest strand of fence wire and pushing at the same time, however. Given his lack of opposable thumbs, Moondo settled on a new tactic and started directing the tank toward the gate. He’s smart, but engineering is a new discipline for him, and positioning a four-foot-long oblong tank to roll sideways through an eight-foot gate proved tricky, especially given that the ground is rocky and uneven. He did manage to get the tank far enough to block the gate opening a couple of times, but at that point I decided he’d never quit if he did get the thing out into the Big Pasture, so I started pulling the tank back where I wanted it. In the spirit of compromise, I let that spot be at the top of the hill, where Moondo can look down into the Big Pasture as he eats. And that’s where things are now. The tank isn’t stationery, but attempts to get it out the gate have been half-hearted. Moondo seems to be satisfied with the view from his breakfast table. I’m glad he’s s found a way to exercise self-determination that doesn’t involve obnoxious behavior. And since he’s figured out how to adjust the tank’s position, I figure it’s now up to him to move it—or not—when a gale is belting over the land and whisking hay from between his lips. 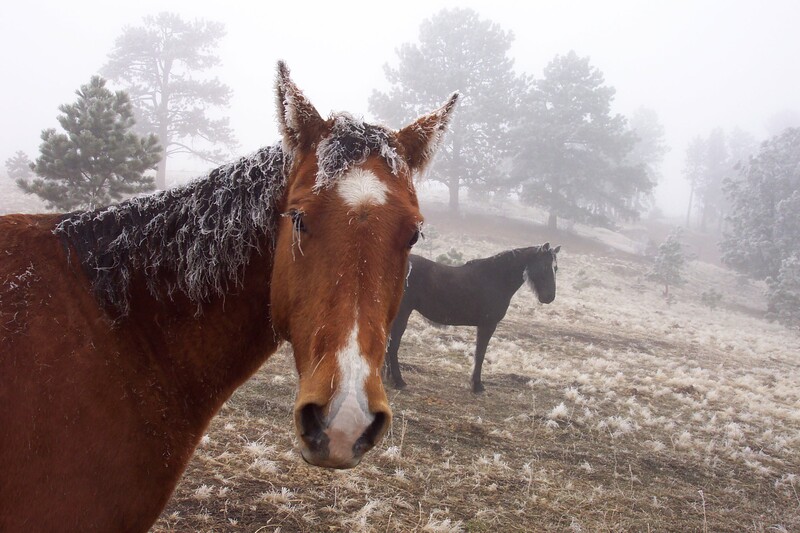 This entry was posted in animal communication, horses and tagged horse behavior, Moondo. Bookmark the permalink.